There's multitail thing to tail multiple logs, potentially interleaved, in one curses window, which is a painful-to-impossible to browse through, as you'd do with simple "less". There's lnav for parsing and normalizing a bunch of logs, and continuously monitoring these, also interactive. There's rainbow to color specific lines based on regexp, which can't really do any interleaving. This is an interleaved output from several timestamped log files, for events happening at nearly the same time (which can be used to establish the sequence between these and correlate output of multiple tools/instances/etc), browsable via the usual "less" (or whatever other $PAGER) in an xterm window. 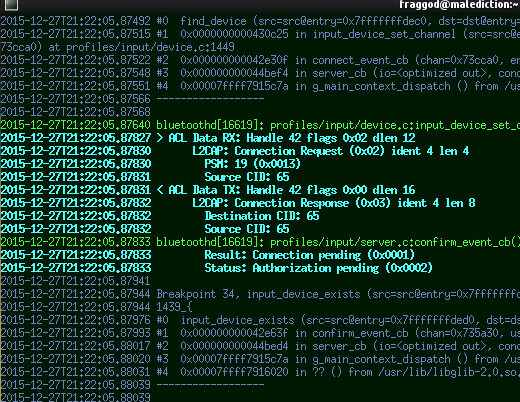 In this case, logfiles are from "btmon" (bluetooth sniffer tool), "bluetoothd" (bluez) debug output and an output from gdb attached to that bluetoothd pid (showing stuff described in previous entry about gdb). Output for neither of these tools have timestamps by default, but this is easy to fix by piping it through any tool which would add them into every line, svlogd for example. Note that "btmon" runs via coreutils stdbuf tool, which can be critical for anything that writes to its stdout via libc's fwrite(), i.e. can have buffering enabled there, which causes stuff to be output delayed and in batches, not how it'd appear in the terminal (where line buffering is used), resulting in incorrect timestamps, unless stdbuf or any other option disabling such buffering is used. With three separate logs from above snippet, natural thing you'd want is to see these all at the same time, so for each logical "event", there'd be output from btmon (network packet), bluetoothd (debug logging output) and gdb's function call traces. It's easy to concatenate all three logs and sort them to get these interleaved, but then it can be visually hard to tell which line belongs to which file, especially if they are from several instances of the same app (not really the case here though). Simple fix is to add per-file distinct color to each line of each log, but then you can't sort these, as color sequences get in the way, it's non-trivial to do even that, and it all adds-up to a script. Seem to be hard to find any existing tools for the job, so wrote a script to do it - liac (in the usual mk-fg/fgtk github repo), which was used to produce output in the image above - that is, interleave lines (using any field for sorting btw), add tags for distinct ANSI colors to ones belonging to different files and optional prefixes. Thought it might be useful to leave a note for anyone looking for something similar.